I have a healthy version of pizza to share with you all. It's Eggplant Pizza and this recipe tastes so good and it's healthy. This recipe is lighter than regular pizza and the crust is eggplant not bread. This dish is easy to prepare and it can be ready in no time. I'd love to share the recipe with you! Here is a step by step photo of the process to make the eggplant pizza. Preheat oven to 375 degrees F. Cut both ends of the eggplant and cut it into 3/4 inch slices. Place eggplant on tray and sprinkle each slice with salt. Let sit this way for about 30 minutes to draw out the liquid. While eggplant sits heat up your tomato sauce on low. After 30 minutes wipe the eggplant dry with paper towels. Spray baking sheet with non-stick spray and then place eggplant on the sheet. Brush tops of eggplant with olive oil and sprinkle tops with dried Italian seasoning and salt and pepper to taste. Roast the eggplant for 25 minutes. While eggplant roasts, slice basil leaves and combine together parmesan and mozzarella cheese together. When eggplant is done roasting take out of oven and set oven to broil. Spread a few tablespoons of sauce on top of eggplant and then sprinkle basil on top with generous amount of cheese mixture. Put the tray of eggplant pizza under the broiler until cheese is melted and slightly browned 5 to 7 minutes (but watch carefully not to burn). This dish would be great served with Italian or Garlic Bread and a Salad! 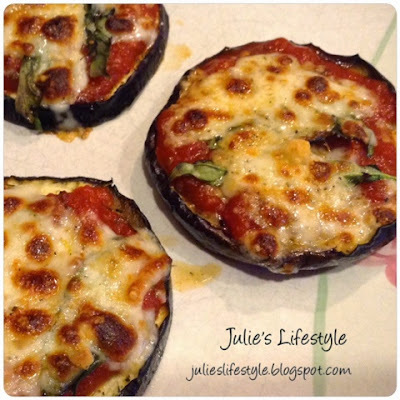 This eggplant pizza recipe looks so good, Julie! Thanks for sharing! 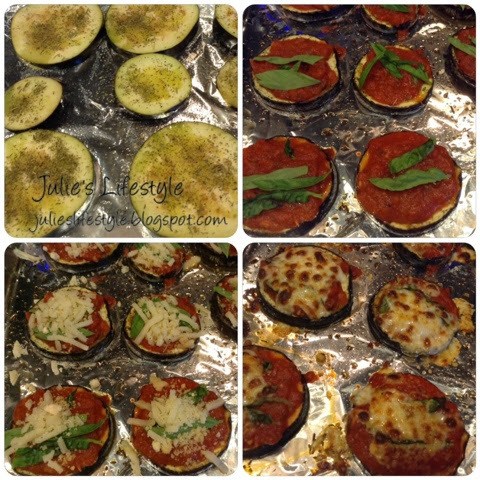 I love this idea with the eggplant for mini pizzas. I would be honored if you would stop by and share your recipe today at Foodie Fridays. It's not all real food at the party but I would love to infuse a big healthy dose of it into the party. Thanks so much and I hope to see you there. This looks so good Julie! I love pizza and this will get me to eat eggplant more. Have an awesome weekend. Good Morning Julie, I do enjoy a nice pizza, but I have never eaten one with aubergines (eggplant), but your pizza has all the ingredients I love. This is certainly on my list to make. Have a lovely weekend Julie. I love Eggplant, a must try. Your eggplant looks amazing. I grew eggplant for the first time this year and am always looking for more ways to cook it! Thanks for sharing with Foodie Friends Friday! Hope to see you again this week! That looks great! I just bought an eggplant but needed a recipe. Now I have one! Thank you! OOOH! I love pizza and can't really eat grains anymore! This looks so good! Thanks you for sharing! What a fun and neat meal! I love the idea of replacing the pizza crust with eggplant, besides all these flavors match perfectly! Thanks for coming and linking up at The Weekend Social. All posts get pinned in our pinterest board! Please be sure to come back next week starting Thursdays at 9PM EST on culinaryflavors.gr ! I hope to see you there! That looks great! What a clever idea. My husband and I both like eggplant, but I am still working on the kids. I am hoping their tastebuds change...they're still teenagers...plenty of time! :) Thanks for linking it up with us at Foodie Fridays! Great idea! Thanks for joining HSH! Love this recipe! The kids? Probably not so much:( But I can always just make enough for me:) Thanks for sharing your recipe with us at the Merry Monday Link Party! Hello, These look amazing, I will be trying these very soon! As we love eggplant! You have a very lovely blog! I enjoyed this visit! Thank you so much for sharing at the Twirl & Take a Bow Party! Have an awesome week! So, can't wait to try this, thanks for sharing on Real Food Fridays, featuring on tomorrow's party. I love eggplant! And pizza! These eggpalnt pizzas look amazing!! Will definitely have to try soon! I haven't cooked with eggplant before, but this looks like a great recipe to try. I am an eggplant lover, I'll have to give this a try. LOVE eggplant, and this recipe sounds delicious and simple...perfect combination. Thank you so much for sharing you eggplant parmesan at the #PureBlogLove link party! This recipe sounds fantastic and I can hardly wait to see what you bring to next week's party on www.themccallumsshamrockpatch.com. We will be pinning, and sharing this awesome recipe on our social media!The party starts at 8pm est Thursdays and runs all weekend long!! This is a great recipe! Featuring you tomorrow. I remember last month I wanted to make some. It's so healthy! This wonderful post was featured on the Art of Home-Making Mondays this week! Please join us again this week as our new link up is now up and running :) Happy Monday! What a great Eggplant Recipe, it looks so good! Thanks so much for sharing your awesome recipe with us at Full Plate Thursday this week. Hope you have a fantastic day and come back real soon! I love this idea, Julie. Your Eggplant Pizzas are delicious, healthy and so family friendly! Thank you for sharing them with us at the Hearth and Soul hop. Thanks for making me hungry......and thanks for sharing your recipe with us at Make It Monday! Came over from Make It Monday to read the recipe. I am grain-free and it is hard to find pizza recipes without flour! Thanks so much. Pinning and trying. Julie, I would love this, but hubby not so much. I use to make an eggplant parmesan. After I had made it for the third time he said, "I really don't care for this". He is so easy going and always eats everything I fix. I knew if he said that he really hated it. lol! Thanks for sharing with SYC. Stopping by from Thank Goodness it's Thursday link party. Love a healthy alternative instead of using bread crust. What a neat idea! Thanks for linking up at the Bloggers Brags Pinterest Party. I love the blend of ingredients in your Eggplant Pizza recipe. What a tasty, satisfying meal! I love trying different pizza recipes. I put vegan cheeses on my pizzas and they work well too. Thank you so much for sharing these healthy and delicious recipes at the Healthy, Happy, Green and Natural Party Blog Hop. I appreciate it! Hello, Loved these, I just happen to have an eggplant sitting on the counter and I will make these again tonight! Thank you! Did you try those hearts? I found an easier design and have been making them, and they are a little bit bigger also! Now this recipe I have to try! I am going grocery shopping tomorrow or Thursday and will be putting eggplant on my list. Thanks, my friend, for sharing at Roses of Inspiration. Hugs! Now this is one recipe I can eat on my plan. Looks so delicious ... love eggplant and will give it a try. That looks so delicious! I love eggplant and thank you for another way to try it! This pizza looks delicious, Julie! Do you know, I have never eaten eggplant? I must give it a try because it would be a nice alternative to a crust. Thank you for sharing. Hi Julie! This looks like a great recipe. I haven't made eggplant in years. I will have to give this a try. This is perfect for me to have when my husband and son are eating their man food! Thanks for the recipe! Oh, I need to try this! I once tried to put some sliced eggplants in the oven, but they didn't turn out great, so this time I'll go by your instructions! Thank you for sharing this recipe at The Really Crafty Link Party this week! Pinned! Yum! That looks so good. Definitely going to have to give that a try. I love eggplant ... I love pizza ... I am trying to avoid flour ... so, this recipe sounds like one I need to try. 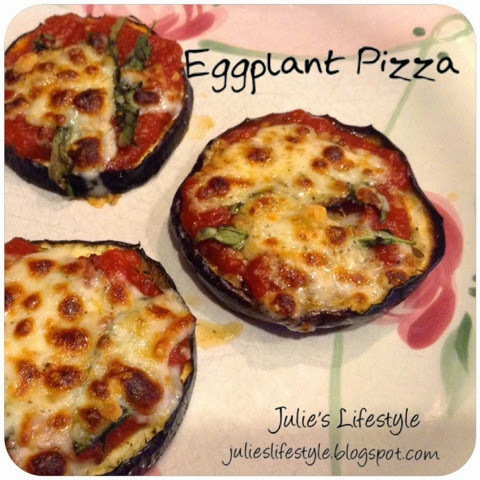 I'm liking the idea of this eggplant pizza - so creative! And a great way to sneak in some veggies. :) "Oh, it's just crust. You'll like it!" Oh my goodness, this looks delicious! I love eggplant and this really jazzes it up. Thank you so much for linking with Thoughts of Home on Thursday. You make us proud! I have been looking for a way to substitute for the crust. I tried portabello mushrooms butZi lime the idea of the eggplant! Pinned, tweeted, and yummed! Yum...sounds so good! Thanks for sharing with the Thursday Blog Hop! What a clever pizza recipe! I love eggplants so this is a definite must-try for me. Thanks so much for sharing it on #Shinebloghop this week! Sure sounds like a tasty pizza Julie! Thanks for sharing at Merry Monday. It's got my favorite pizza ingredient which is cheese! Ooooh, I remember when you shared this yummy recipe :) I'm so glad you shared it with Roses of Inspiration. Have a delightful weekend, dear Julie. My daughter has a gluten allergy and this eggplant is such a great and clever alternative! This looks wonderful, Julie! Your Eggplant Pizzas are a lovely meatless meal! Thank you for sharing them with us at the Hearth and Soul Hop. Shared. Julie, I will be featuring your pizza post at No Place Like Home on Monday. Enjoy your weekend. Julie, Eggplant pizza looks delicious and awesome thanks for sharing with Hearth and soul blog hop. pinning. tweeting. I make an eggplant pizza so similar to this! It's amazing! Check out my blog for the zucchini version! Pizza is one of my favorite treats! I am so delighted that you shared your healthy and delicious Eggplant Pizza recipe with us at the Healthy Happy Green Natural Party! I'm Pinning and sharing this! Thank you for sharing on the Healthy Living Link Party! We are always needing new ways to use up eggplant and this sounds just perfect:) We will be featuring your recipe tonight so don't forget to drop by and grab your Featured button! Have a great evening! So healthy and delicious! With ingredients like these who can resist this! I am so glad you shared your Eggplant Pizza with us at the Plant-Based Potluck Party. I'm pinning and sharing! Yum! I love eggplant; this sound so delish! This looks delicious! I can't wait to try it. Thank you for sharing.